It’s the most wonderful time of the year. The big guy in red is hard at work flying around the world in just one night. He needs something to keep him going. There’s nothing better than a sweet treat like cookies and a Gansett porter to wash it down. 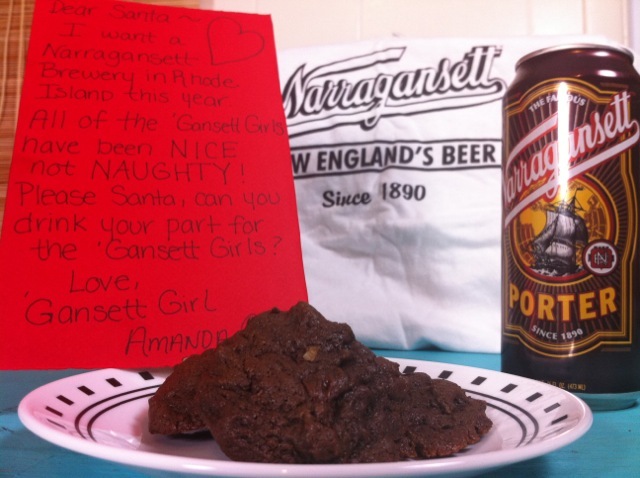 This week’s recipe just happens to be some delicious cookies made with Narragansett Porter from Gansett Girl Amanda. She even included her own letter to Santa. We hope you enjoy these as much as we did. Chocolaty and Soft with a little bit of ‘Gansett Goodness! Preheat oven to 350 degrees Fahrenheit. Pour ½ cup of Narragansett Porter in a small saucepan and let it reduce by half on medium high heat. Keep an eye on the beer so it does not boil. Adjust the heat to a lower temperature if the beer starts to boil. 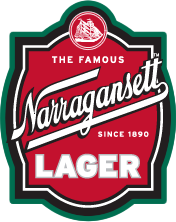 Cool the Narragansett Porter. In a large bowl, cream butter and sugars until light and fluffy; add egg, reduced Narragansett Porter, vanilla and milk. In a medium bowl combine flour, cocoa powder, baking soda and salt. Blend the flour mixture with almonds and chocolate chips. Drop heaping tablespoonfuls about 2 inches apart on a greased cookie sheet. Bake 10 to 12 minutes or until set. Do not over bake. Cool for 1 minute on cookie sheets and then transfer to wire racks. Store tightly in a covered container. Lastly, the rest of the open Porter can and should be consumed during the cookie making process by an of age adult! Happy Holidays!